Since his knee surgery six weeks ago, the principal of GBHS, the government high school in Fundong, has been immobilized. He was put in a plaster cast up to his thigh and down to his ankle for 2 months… Shocked at the lack of modern techniques, I explained this operation had not been performed in the States in forty years. 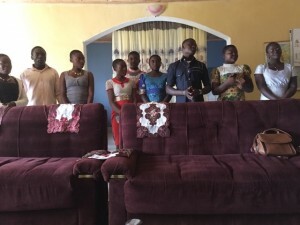 Each time I dropped by the house, there were colleagues and friends who had come to visit him. . One memorable Sunday, the Evangelist church choir dropped by, singing with such fervor, I was expecting the resurrection of Christ. To keep from rolling my eyes, I had to leave the room. Religion in Africa is like Scientology in America; scary. Another day I dropped by his house, the visitors were his French teachers from the high school. Curious about the Francophone program, I asked how many students were taught in French. There are 2000 students at the school but only 89 are taught in the French language. And there are 27 teachers officially appointed to teach them. Then came the punch line .. for the remaining 1900 plus students there were 37 teachers. The average class in the Anglophone section ranged from 80 to 200 students. Obviously the government did not want to create a functioning school system, something I had figured out years ago. Educated people are dangerous for dictatorships. Each year when I am here for six weeks, I spend several hours a day at the high school questioning students about their classes, their life outside school and what subjects are their weakest. Form 1, 2 and 3, are equivalent to junior high in the States. Asking the kids how many subjects they were forced to take, the number ranged from 12-15 subjects. Some of these classes were bordering on the absurd for seventh and eighth graders; philosophy, psychics, literature and the Kom tribal language. Many of these youngsters were barely fluent in English, since they spoke their tribal language or pigin at home.. The public school principal cannot change or challenge the curriculum. A new teacher has to wait three years before they get their back pay. But a government appointed teacher at the high school could not be fired even though she was a bad instructor and rarely taught her class. Regardless of letters to the education authorities, she kept receiving sick leave and after three years, she is still collecting her salary. Back in the days of the English boarding schools, there were discipline masters who hit students with canes and straps. Even though the government here has banned physical abuse in the schools, it has continued. There are five appointed discipline masters at GBHS. Both discipline masters and regular teachers beat the students. And it seems the teacher is always justified. When I went to school there was a principal and a vice principal. Here there are 5 vice principals on payroll with a shortage of teachers. Many of us who complain about the education system in American public schools, would be horrified with the conditions and the curriculum here. Two years ago when I was here in Cameroon, I did some work with a group of women and children with AIDS. Helmina began the group in 2010 with 30 women and children. There are now 27 children and 53 adults. She was infected by her husband in 2002, before she gave birth to her 5th child, who was tested at age 2 and was positive. Her husband refused to take the pills and died in 2010. He never apologised to his wife for infecting her. Buying the antiretroviral pills in 2003 cost 15,000 cfa ($35) plus transport to the clinic 1.5 hours away. At that time the minimum wage here was 28000 cfa ($60) per month . She borrowed from high interest lending clubs, some charging 75% interest. Finally in 2006 the price dropped to 3000 cfa a month and in 2008 the drugs were free to HIV positive people with a CD4 count of 350. Many died before the drugs were free because they lived on less than a dollar a day. Her daughter, who had many opportunistic illnesses, was denied antiretroviral drugs in 2010 because her T-cell count was 350,. Finally in 2014 when I first met the group, I noticed she had Kaposi sarcoma on her legs. I gave them the equivalent of $20 for transport and doctor fees; she has been on the antiretroviral drugs for 2 years and her count is 800. If I can diagnose a medical illness, can you imagine the quality of medical care in this country.